1 Comment on In Bern…YB anywhere else? THERE’S a nice reminder that Bern once played host to the World Cup final. In 1954, “Das wunder von Bern” took place – West Germany beating the people’s favourites, Hungary – Ferenc Puskas and all. 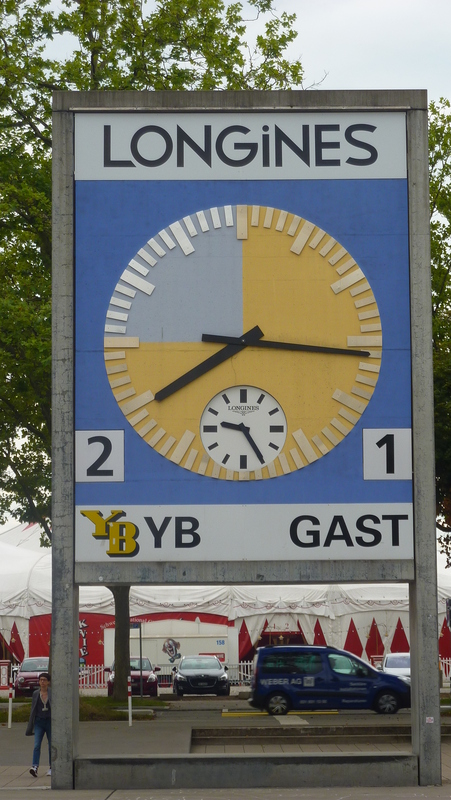 They’ve reconditioned the clock that stood in the Wankdorf Stadium on that memorable afternoon. “The wonder of Bern” is certainly more appropriate than “miracle” as we are talking football here and not about a heavenly body walking on a lake, but there is something magical about that story, as captured in the Disneyesque movie of the same name. And it all took place in charming and understated Bern. 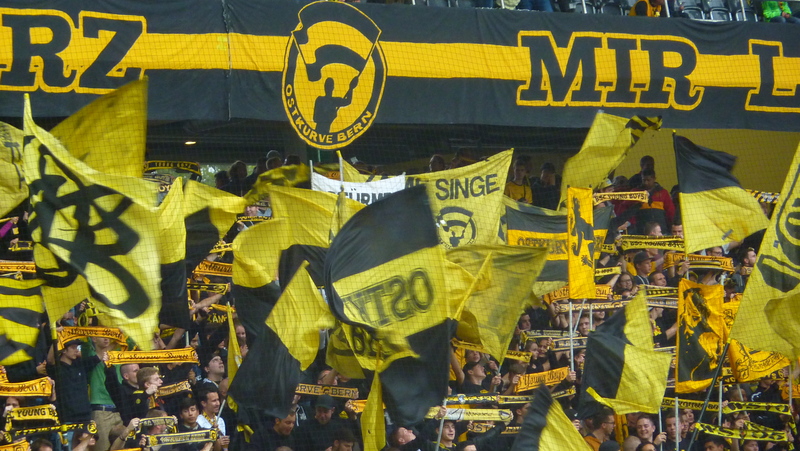 For Wankdorf, read Stade de Suisse and for Fritz Walter, Bern football folk have Michael Frey and Yoric Ravet, members of the Young Boys team that fancies itself as possible title contenders in 2016-17. In 2015-16, they finished runners-up – admittedly by a 14-point margin – to Basel and qualified for the UEFA Champions League. It was their third consecutive decent campaign as they were second in 2014-15 and third in 2013-14. The problem that all Swiss clubs have is how to overcome the [relatively] mighty and monied Basel. A week before Game of the People arrived in Bern, Basel had underlined their superiority by beating Young Boys 3-0. A few days later, Young Boys played host to Germany’s Borussia Moenchengladbach in the play-off round of the UEFA Champions League and were beaten 3-1 at the Stade de Suisse. A near full house saw the game, but the feeling was that YB were simply not strong enough. Still, if they go out, there’s always the Europa League to look forward to. Stade de Suisse doesn’t look much like a football stadium from the outside, but it’s well placed on Papiermühlestrasse and opposite parkland which had a circus in progress when we arrived. In the background, you could just see snow-topped mountains, which on a very clear day must provide a beautiful backdrop. The stadium is more than just functional and is spacious and comfortable. I decided to adopt a “when in Rome” approach and opted for the traditional pre-match sausage and beer, then stood with regulars and listened to their analysis of the game with Moenchengladbach. It was all German to me, but occasionally, I was brought into the conversation until they realised my dumbstruck response meant I wasn’t a local or indeed, ignoring them. The game with Lausanne promised to be difficult. Both teams had played four Super League fixtures, with newly-promoted Lausanne in third on seven points and Young Boys one behind in fourth. 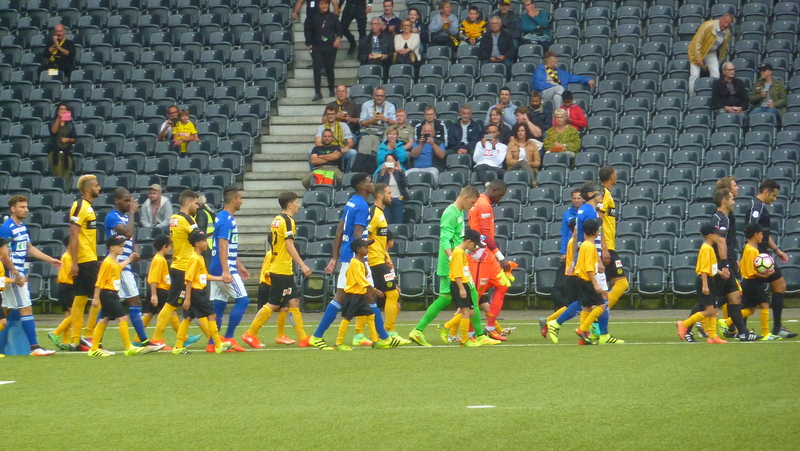 Young Boys had won two of their four games, beating St.Gallen away 2-0 and Thun at home 4-1. Behind the goal, at the Papiermühlestrasse end, the YB “ultras” were finding their voice – flags aplenty and the customary continental European orchestrator with his microphone. There were around 300-400 ultras by my estimation, mostly aged between teenage and early 20s. They rarely stopped singing for the next two hours. But they did have plenty to sing about. Within two minutes, YB had gone ahead, a free kick volleyed home by 6 ft 4 in French striker Guillaume Hoarau, a 32 year-old who played five times for France and in a long career, for Bordeaux, Paris St. Germain and China’s Dalian Yifang. Hoarau was one of two Frenchmen in the YB starting line-up, Ravet, who scored at the near post in the 30th minute to put YB 2-0 ahead, being the other. The YB side XI was mostly Swiss, the other foreigner being Yuya Kubo from Japan. Lausanne had eight Swiss in their starting team, the ubiquitous Brazilian, an Italian and in defence, the Portuguese Elton Monteiro. Poor old Elton, who spent time with Arsenal as a youngster, teed-up YB for their third goal when he played the ball across the face of goal, straight into the path of substitute Thorsten Schick, who scored easily on 37 minutes. Schick, an Austrian, had replaced Hoarau who had left the field injured. Three minutes later, Lausanne scored through Samuele Campo to make the half-time scored 3-1 to Young Boys. Half-time was time to refuel on more sausage, if only to avoid the plethora of advertising you get at a Swiss game. One nice idea, however, was the on-screen presenter, something which was tried at the Olympics in London 2012 and would provide something more compelling than the thumping music and “games for the chimps” approach of Wembley and other stadiums in England. YB picked up from where they left off after the break and within four minutes, Scott Sutter netted with a volley at the far post. Lausanne were crumbling at the back and on 59 minutes, the goal of the game was scored when another YB substitute, the Czech Jan Lecjans, sent a spectacular shot in off the crossbar. Lausanne kept running and added a second goal in the 76th minute through North Korean striker Kwang-Ryong Pak. The final goal, in added time, making the score 7-2, went to YB, when Michael Frey, who joined YB from Luzern in the close season, took advantage of some careless work by Lausanne keeper Thomas Castella and returned the ball into the net. A bizarre scoreline and a thoroughly entertaining evening. Some of the defending was questionable, but the 14,665 crowd – with the exception of the two dozen Lausanne fans in the top corner of the stand, all scarves and bare chests – went home happy. Who could really complain about nine goals?